Our team consists of members from different field of studies. 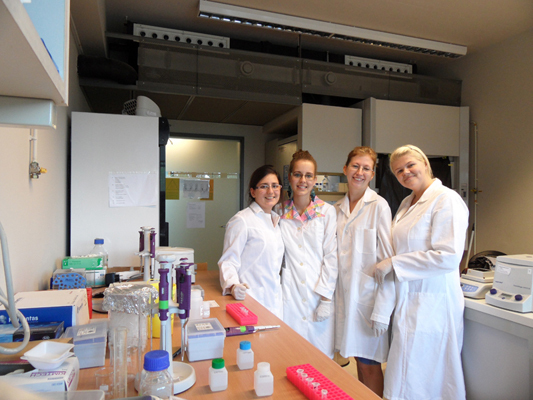 We have four molecular biologist master students, a Biotechnology M.Sc. student and a biology bachelor student working in the wet lab. We also invited a high school student to join the team giving her a chance to try herself in the bond of a Lab at a University. We all think that it was fun and also beneficial to be together, learning from and supporting each other during the summer. We really got close to each other, and we're sure that we will keep in contact even after the Jamborees. Bálint L. Bálint M.D. Ph.D.: He graduated at the Semmelweis University, Budapest in 1996. After direct work with patients, Bálint decided to immerse into science and joined Laszlo Nagy's laboratory in Debrecen in 2001 and got his Ph.D. in 2006 in the field of Molecular Biology. Since then he obtained experience in the embryonic stem cells and genome-wide chromatin studies. Bálint is the Laboratory Director of the "Clinical Genomic Centre" at the University of Debrecen, and also the Laboratory Head of UD-GenoMed Medical Genomic Technologies Ltd.
Bence Dániel: Ph.D. student in the field of molecular biology at the University of Debrecen, Department of Biochemistry and Molecular Biology. He started his scientific work three years ago, since then he dealed with iPS from fibroblasts followed by ligand testing on nuclear receptors and natural ligand finding project for PPARg nuclear receptor. Now he is running on a protein-protein interaction story in macrophages. Endre Károly Kristóf M.D. : Ph.D. student in Apoptosis Research Group at University of Debrecen, Department of Biochemistry and Molecular Biology after graduating general medicine. His research interest is to investigate the molecular regulation in the interaction between dying cells and phagocytes. Gábor Zahuczky Ph.D.: He was graduated as Chemist, English-Hungarian technical translator and also he has a Bsc. degree in business administration. He did his Ph.D. on molecular cloning and characterisation of retroviral proteases and human caspases at the Department of Biochemistry and Molecular Biology in József Tőzsér's lab. Since 2003 he is an integral member of László Fésüs's research team in the same department. Currently he is working on the role of dexamethasone in the enhancement of phagocytosis in macrophages. He is the Managing Director of UD-GenoMed Medical Genomic Technologies Ltd.
Péter Brázda: Peter has graduated as a Biologist at the University of Debrecen. He became linked to László Nagy's group as an undergraduate student working on the characterisation of a new synthetic nuclear receptor ligand. Later he started working as a Ph.D. student in the same lab focusing on mobility using live cell confocal microscopy. Gergely Nagy: He has graduated as a Molecular Biologist at the University of Debrecen. He has been working at the Department of Biochemistry and Molecular Biology as a Ph.D. student for 2 years, and now he is dealing with CD1 promoter and 5' transcriptome analysis. Katalin Sándor: She is a Ph.D. student at the University of Debrecen, Department of Biochemistry and Molecular Biology. She is working at the Apoptosis Signalling Laboratory and dealing with the anti-inflammatory effects of apoptotic cells. As a second-year iGEMer she is happy to help the Team, this time as an advisor. 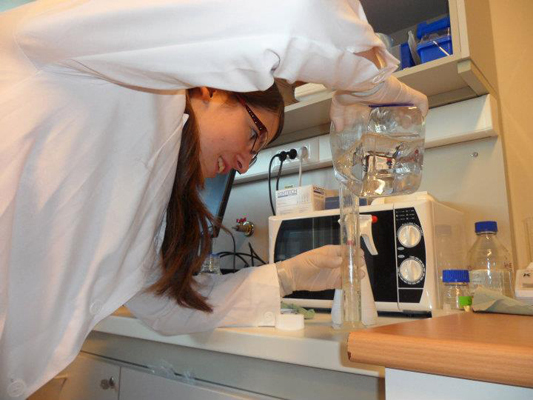 Tímea Beregi: She is a Molecular Biology Master student at the University of Debrecen. She is working at the Isntitute of Biochemistry and Molecular Biology at the Nuclear Receptor Research Laboratory for two years. Her interests lie in microRNA (miRNA) and it's diverse effects on gene expression. She views synthetic biology as a part of her future, and hope to be a Ph.D. student next year. Éva Bernadett Bényei: She is studying at the Kossuth Lajos Secondary Teacher Training Grammar School of the University of Debrecen. She wishes to continue her studies in sciences in the future. She has learnt a lot during the time she spent with the iGEM team of Debrecen and she is sure, she will be able to use the knowledge gathered in cell-biology and biochemistry. Also she thinks that it was amazing to participate in the enthusiastic team work. 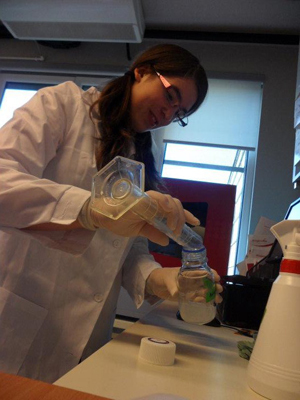 Beáta Boros-Oláh: She is a third year biology bachelor student with molecular biology specialization at the University of Debrecen, Faculty of Science and Technology. She started her diploma work this year at the Clinical Genomics Centre. The main reason why she has joined to the team is to gain more experience of lab work. She was very grateful for the opportunity and felt very happy during the summer. Lilla Ozgyin: Molecular Biology Master student at University of Debrecen. She started her scientific work about two years ago at the Institute of Biochemistry and Molecular Biology, in the Nuclear Hormone Receptor Research Laboratory, and is working with Embrionic Stem Cell feeder cells. She is glad to take part in iGEM for the second time and interested in applying the knowledge gained from iGEM and Synthetic Biology in her future career. Petra Sepsi: Petra is a Master student of Biotechnology at the University of Debrecen. She is working at the Department of Medical Microbiology. She has been examining the effects of Candida in murine models. 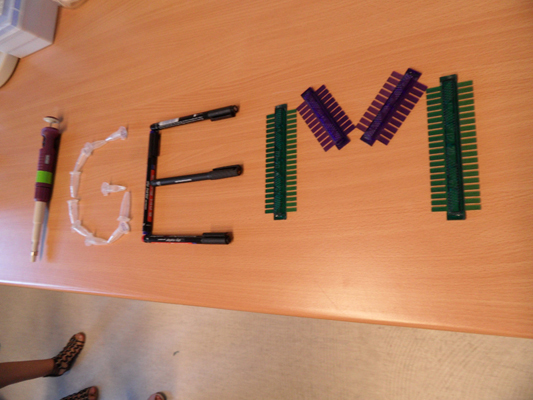 Petra thinks that iGEM is the best opportunity to develop her talents. Ildikó Tándor: Molecular Biology Master student at University of Debrecen. She is studying the gene expression profiles in rheumatic diseases. 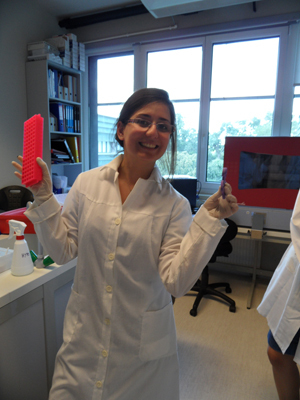 She thinks, she has gained valuable experience in lab-work in this iGEM group. Debrecen is one of the most vivid and coziest nooks in Hungary: this city is a unique and outstanding whirlpool of a dynamic cultural and intellectual heritage and of an effective and successful economic life. The centuries’ old traditions and the most recent technical and scientific innovations enhancing each other make Debrecen a nationally and internationally renowned city. This lively city in the heart of the Carpathian Basin awaits the visitors with a cornucopia of programs and events, from a number of excellent art exhibitions, folk programs to many sports and leisure events. The outstanding collections of the local museums, the historical monuments of the city or the various and imposing programs of local folk traditions enchant all visitors who wish to explore the marvels of Debrecen: choir festivals, folk festivals, carnivals, breath-taking exhibitions, fairs offer their programs and goods for the visitors. At the same time Debrecen, which is a university centre, is also a place for conferences and scientific meetings, and this serves the active and organic cooperation of the city’s economic, scientific, educational and cultural life. This culturally and scientifically active life is combined with a splendid leisure and wellness sphere as well: the recently renovated Mediterranean Aqua Park and the charming Zoo in the centre of the romantic Great Forest offer excellent time for the whole family, while the Aquaticum Wellness and Spa Resort designs exclusive health treatments and wellness care programmes for the visitors as Debrecen is one of the largest centres of mineral thermal water in Europe. This leisure life is enriched by the active sport life of the city: Debrecen has been hosting a number of national and international sports events from national championships to European and World championships. For the lovers of rural country life the Erdőspuszta territories and Hortobágy is a must to visit, because the calm and enchanting atmosphere is an excellent basis for relaxation, while those who seek pleasures in fishing, hunting and riding may also enjoy the region. Thus, this city in the eastern periphery of the country is an unparalleled place – not only because of the flourishing cultural, scientific and social life but because of the dynamic economic and industrial traditions as well, which has established an outstanding and marvellous atmosphere in Debrecen. The history of higher education in Debrecen goes back to the 16th century. The city established the Calvinist College of Debrecen in 1538. The College became soon the most important cultural center of the whole country, where a great number of writers, scientists and politicians received their education. In the 18th century the schools of Law and Theology were founded and although no separate School of Medicine existed, physicians were also trained in the College. Today's University Medical School is rooted in this spiritual heritage. The present day Debrecen is also famous for its schools and higher educational establishments. The Medical School of the University of Debrecen is Central Europe's first campus medical school. It was in the year of the millennium (1896) of Hungary's foundation when the establishment of a modern University was decided upon in Debrecen. The University was officially inaugurated on October 23, 1918 and at that time consisted of four faculties: Arts, Science, Theology and Medicine. The Faculty of Medicine became an independent University Medical School under the supervision of the Ministry of Health in 1951. The Medical School has 22 departments of basic sciences and 25 clinical departments specializing in various fields e.g. clinical chemistry, internal medicine, surgery, orthopedics, radiology, neurology, neurosurgery, psychiatry, pediatrics, obstetrics and gynecology, cardiology and pulmonology, oto-rhino-laryngology, dermatology, ophthalmology, stomatology and urology. The Medical School serves as the city hospital for Debrecen therefore students of upper terms may also obtain their clinical training here. Education at Debrecen Medical School is accredited by the World Health Organization, US Department of Education, The State Education Department (NY, USA), Medical Board of California , the General Medicine Council (UK - PLAB exam is compulsory), Medical Councils of Israel, Ireland, Iran and Norway. In most European countries - not listed above - and also in India the diploma of the University of Debrecen, Medical and Health Science Center is accepted for registration purposes; however a qualifying exam is compulsory. The Nuclear Receptor Research lab, led by László Nagy, focuses on the molecular and cell biology of lipid activated transcription factors, so called nuclear receptors. We are interested in the molecular details of hormone action. Lipid soluble hormones such as oestrogens and retinoids act via these receptors that bind to and regulate the expression of certain genes. The aim of the eleven PhD students, four postdocs and senior researchers, associated with several undergraduate students is to understand the details and molecular determinants of these interactions using molecular and cell biological approaches. To do so, we target our questions from different aspects, applying high variety of techniques, including basic RNA and protein biology, advanced microscopy, animal models, microarray techniques and bioinformatics. The Genomics Center is a core facility and research laboratory, a unit of the Department of Biochemistry and Molecular Biology (University of Debrecen Medical and Health Science Center). It has been established to support the University of Debrecen scientific community, as well as other academic research teams interested in using high-throughput genomics and bioinformatics for their research projects. We put special emphasis on supporting clinical genomics projects investigating the pathomechanism of diseases or searching for novel drug targets.